16 — 2 Irwin/Mc. Graw-Hill ©The Mc. 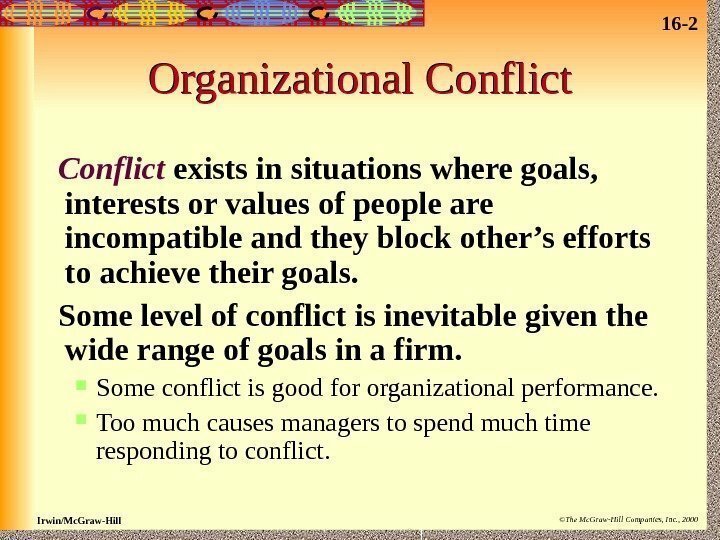 Graw-Hill Companies, Inc. , 2000 Organizational Conflict exists in situations where goals, interests or values of people are incompatible and they block other’s efforts to achieve their goals. Some level of conflict is inevitable given the wide range of goals in a firm. Some conflict is good for organizational performance. Too much causes managers to spend much time responding to conflict. 16 — 3 Irwin/Mc. Graw-Hill ©The Mc. 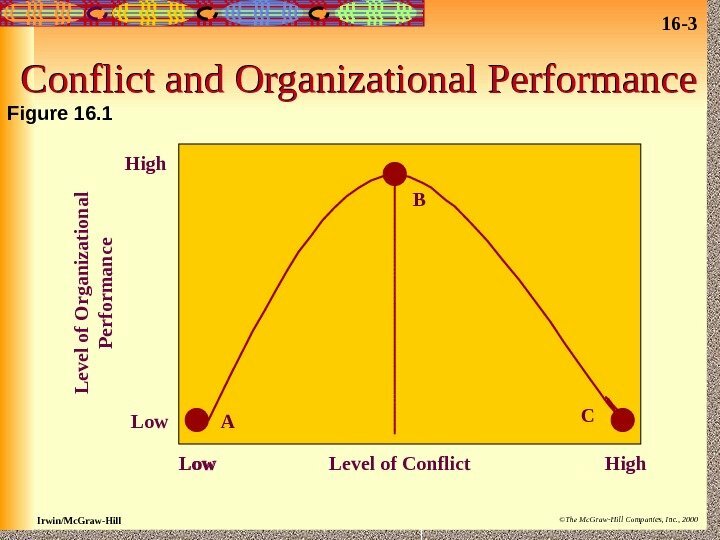 Graw-Hill Companies, Inc. , 2000 Conflict and Organizational Performance Level of Conflict. Low High. Low. High. L evel of O rga n ization al P erform an ce B A CFigure 16. 16 — 4 Irwin/Mc. Graw-Hill ©The Mc. 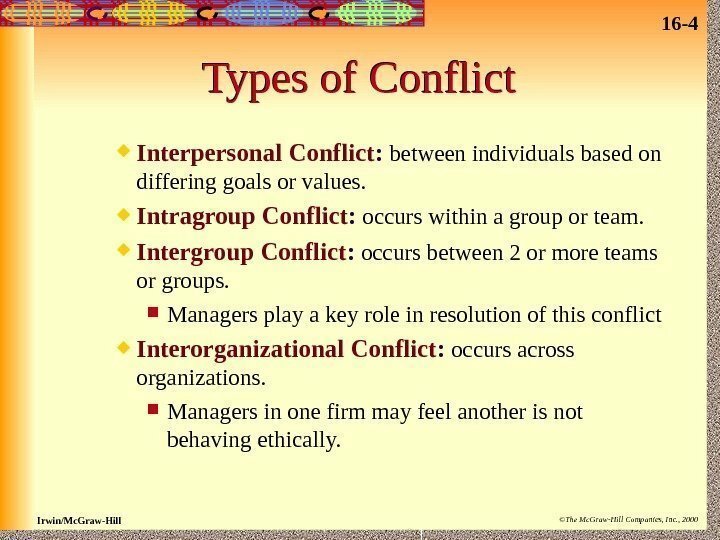 Graw-Hill Companies, Inc. , 2000 Types of Conflict Interpersonal Conflict : between individuals based on differing goals or values. Intragroup Conflict : occurs within a group or team. 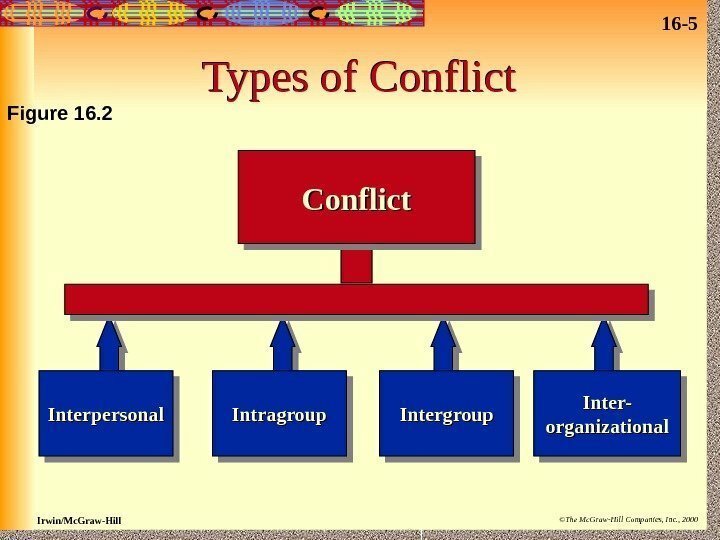 Intergroup Conflict : occurs between 2 or more teams or groups. Managers play a key role in resolution of this conflict Interorganizational Conflict : occurs across organizations. Managers in one firm may feel another is not behaving ethically. 16 — 5 Irwin/Mc. Graw-Hill ©The Mc. Graw-Hill Companies, Inc. , 2000 Types of Conflict Interpersonal Intragroup Intergroup Inter-Inter- organizationalorganizational. Figure 16. 16 — 6 Irwin/Mc. Graw-Hill ©The Mc. 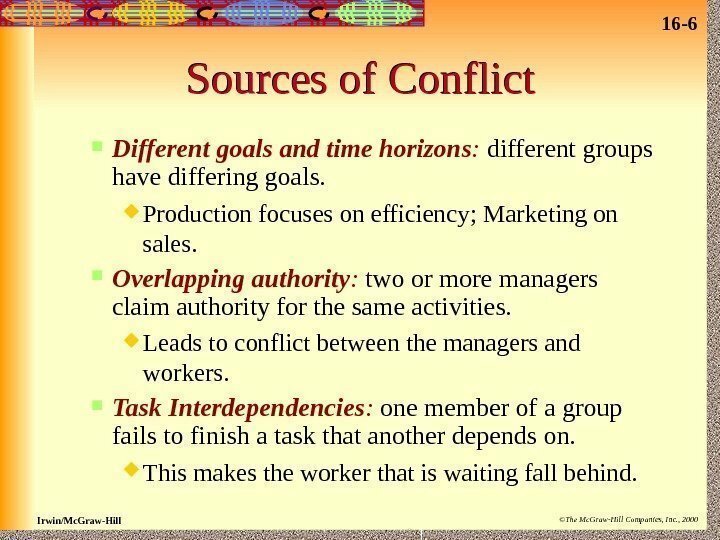 Graw-Hill Companies, Inc. , 2000 Sources of Conflict Different goals and time horizons : different groups have differing goals. Production focuses on efficiency; Marketing on sales. Overlapping authority : t wo or more managers claim authority for the same activities. Leads to conflict between the managers and workers. Task Interdependencies : one member of a group fails to finish a task that another depends on. This makes the worker that is waiting fall behind. 16 — 7 Irwin/Mc. Graw-Hill ©The Mc. Graw-Hill Companies, Inc. , 2000 Sources of Conflict Incompatible Evaluation or reward system : workers are evaluated for one thing, but are told to do something different. Groups rewarded for low cost but firm needs higher service. 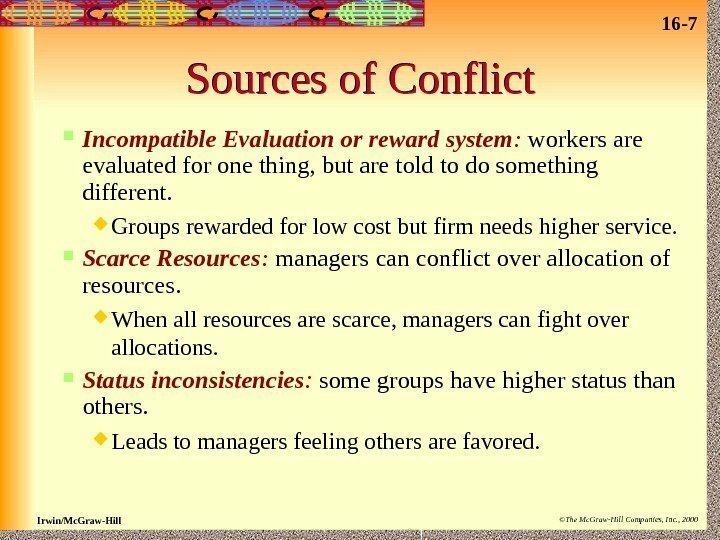 Scarce Resources : managers can conflict over allocation of resources. When all resources are scarce, managers can fight over allocations. Status inconsistencies : some groups have higher status than others. Leads to managers feeling others are favored. 16 — 8 Irwin/Mc. Graw-Hill ©The Mc. Graw-Hill Companies, Inc. , 2000 Sources of Conflict. Status inconsistencyinconsistency Different goals & time horizons& time horizons Scarce Resources Incompatible evaluation & Reward Task Interdependency Overlapping Authority. Figure 16. 16 — 9 Irwin/Mc. Graw-Hill ©The Mc. 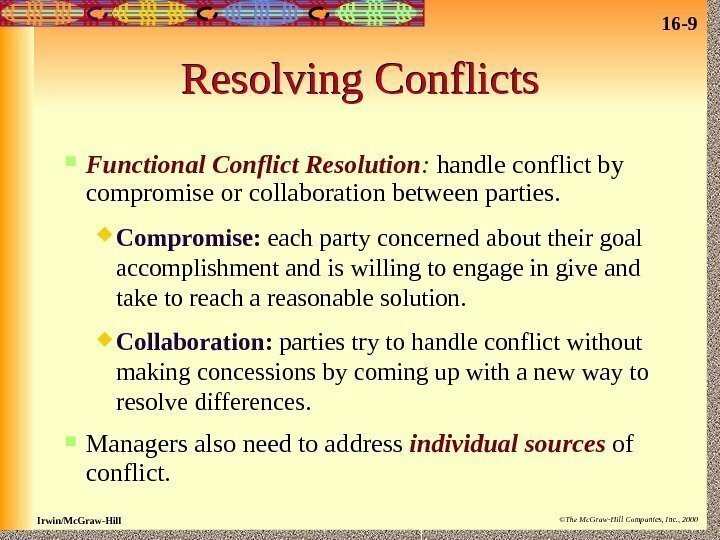 Graw-Hill Companies, Inc. , 2000 Resolving Conflicts Functional Conflict Resolution : handle conflict by compromise or collaboration between parties. Compromise: each party concerned about their goal accomplishment and is willing to engage in give and take to reach a reasonable solution. Collaboration: parties try to handle conflict without making concessions by coming up with a new way to resolve differences. 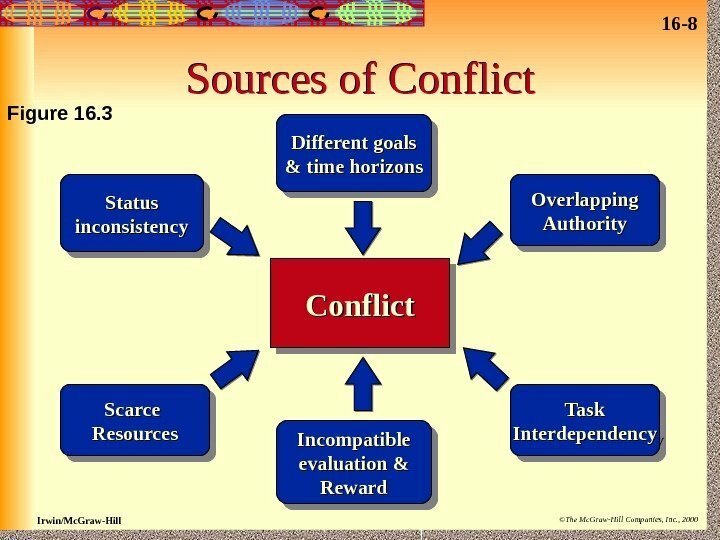 Managers also need to address individual sources of conflict. 16 — 10 Irwin/Mc. Graw-Hill ©The Mc. 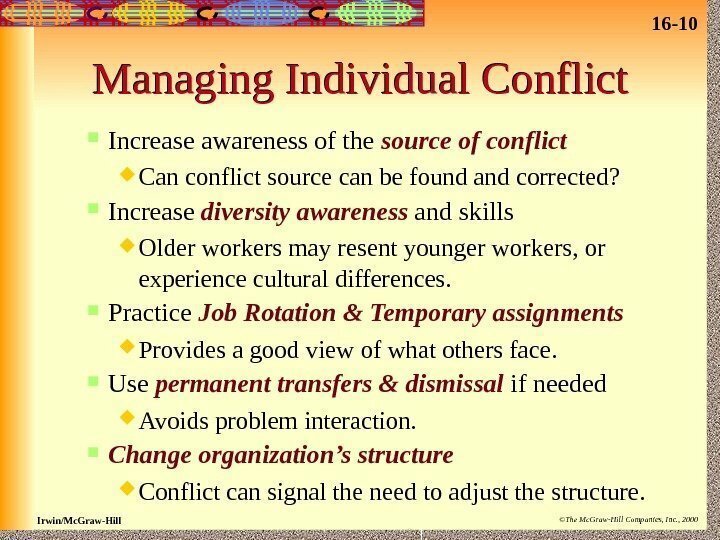 Graw-Hill Companies, Inc. , 2000 Managing Individual Conflict Increase awareness of the source of conflict Can conflict source can be found and corrected? Increase diversity awareness and skills Older workers may resent younger workers, or experience cultural differences. Practice Job Rotation & Temporary assignments Provides a good view of what others face. Use permanent transfers & dismissal if needed Avoids problem interaction. Change organization’s structure Conflict can signal the need to adjust the structure. 16 — 11 Irwin/Mc. Graw-Hill ©The Mc. 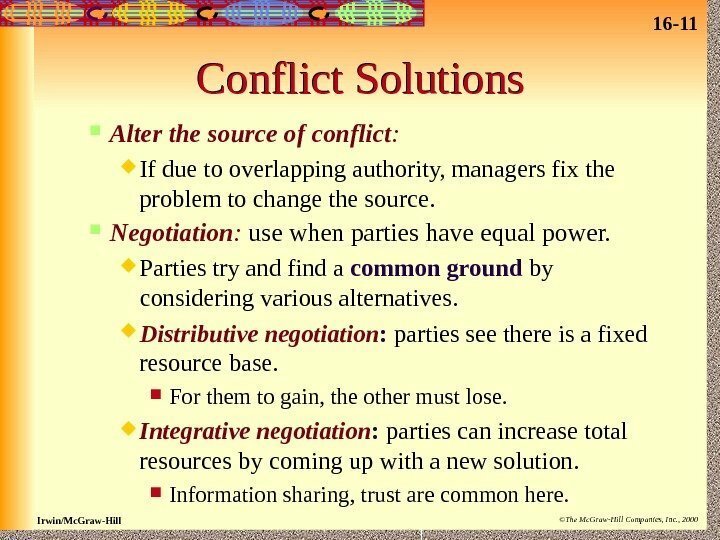 Graw-Hill Companies, Inc. , 2000 Conflict Solutions Alter the source of conflict : If due to overlapping authority, managers fix the problem to change the source. Negotiation : use when parties have equal power. Parties try and find a common ground by considering various alternatives. Distributive negotiation : parties see there is a fixed resource base. For them to gain, the other must lose. Integrative negotiation : parties can increase total resources by coming up with a new solution. Information sharing, trust are common here. 16 — 12 Irwin/Mc. Graw-Hill ©The Mc. 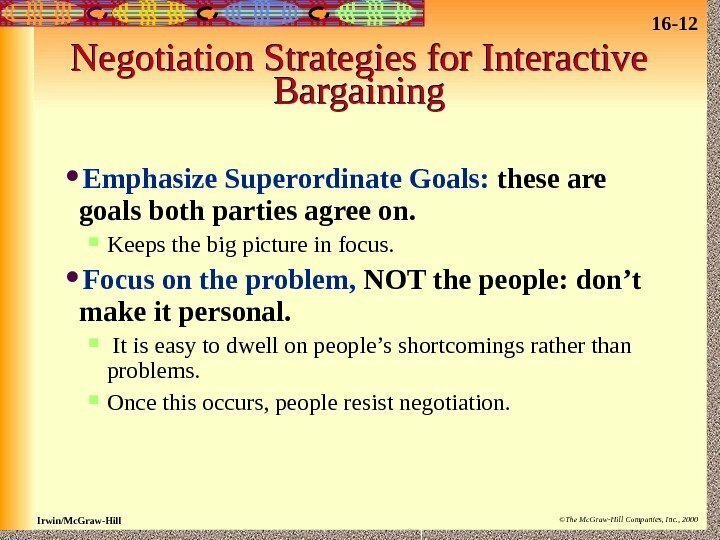 Graw-Hill Companies, Inc. , 2000 Negotiation Strategies for Interactive Bargaining Emphasize Superordinate Goals: these are goals both parties agree on. Keeps the big picture in focus. Focus on the problem, NOT the people: don’t make it personal. It is easy to dwell on people’s shortcomings rather than problems. Once this occurs, people resist negotiation. 16 — 13 Irwin/Mc. Graw-Hill ©The Mc. 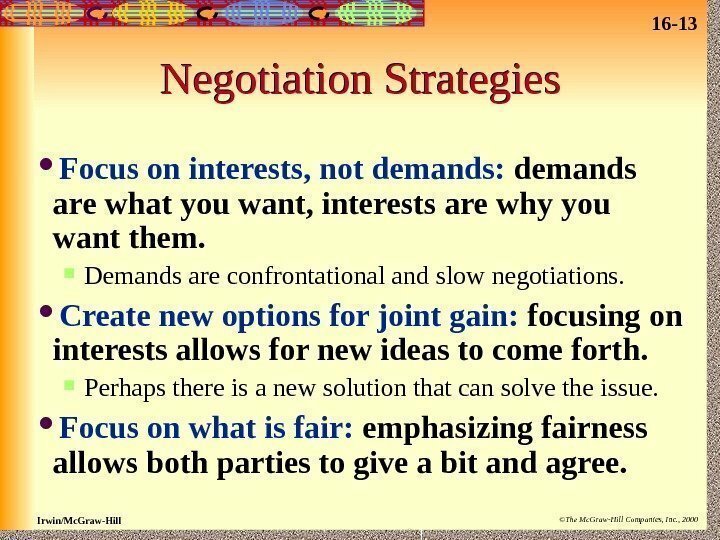 Graw-Hill Companies, Inc. , 2000 Negotiation Strategies Focus on interests, not demands: demands are what you want, interests are why you want them. Demands are confrontational and slow negotiations. Create new options for joint gain: focusing on interests allows for new ideas to come forth. Perhaps there is a new solution that can solve the issue. Focus on what is fair: emphasizing fairness allows both parties to give a bit and agree. 16 — 14 Irwin/Mc. Graw-Hill ©The Mc. 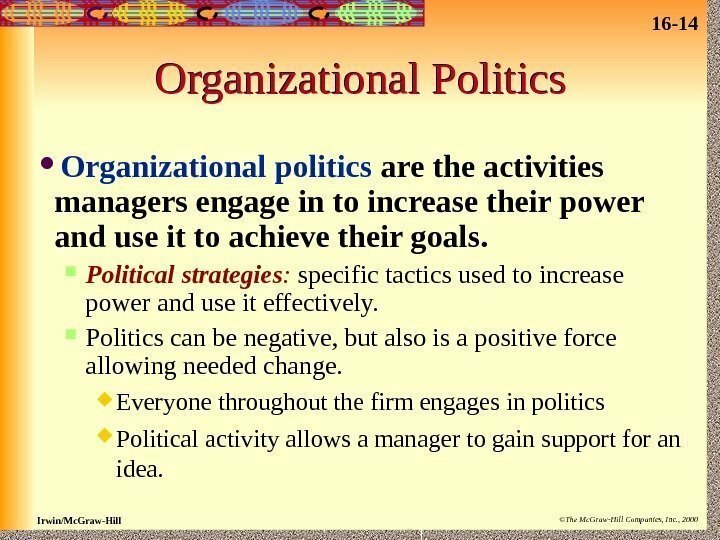 Graw-Hill Companies, Inc. , 2000 Organizational Politics Organizational politics are the activities managers engage in to increase their power and use it to achieve their goals. 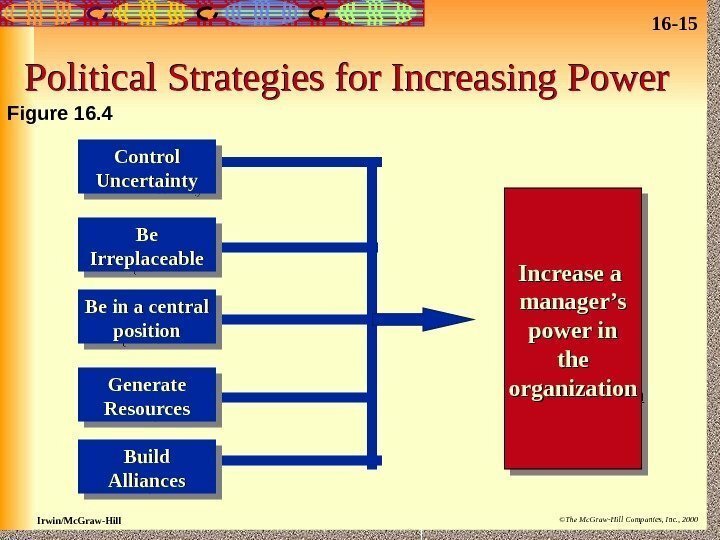 Political strategies : specific tactics used to increase power and use it effectively. Politics can be negative, but also is a positive force allowing needed change. Everyone throughout the firm engages in politics Political activity allows a manager to gain support for an idea. 16 — 15 Irwin/Mc. Graw-Hill ©The Mc. Graw-Hill Companies, Inc. , 2000 Political Strategies for Increasing Power Control Uncertainty Be. Be Irreplaceable Be in a central position Generate Resources Build Alliances Increase a manager’smanager’s power inpower in thethe organizationorganization. Figure 16. 16 — 16 Irwin/Mc. Graw-Hill ©The Mc. 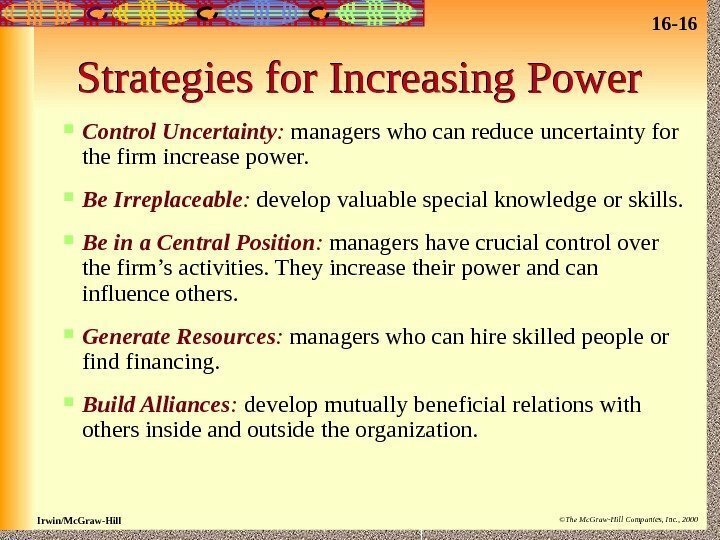 Graw-Hill Companies, Inc. , 2000 Strategies for Increasing Power Control Uncertainty : managers who can reduce uncertainty for the firm increase power. Be Irreplaceable : develop valuable special knowledge or skills. Be in a Central Position : managers have crucial control over the firm’s activities. They increase their power and can influence others. Generate Resources : managers who can hire skilled people or find financing. Build Alliances : develop mutually beneficial relations with others inside and outside the organization. 16 — 17 Irwin/Mc. Graw-Hill ©The Mc. 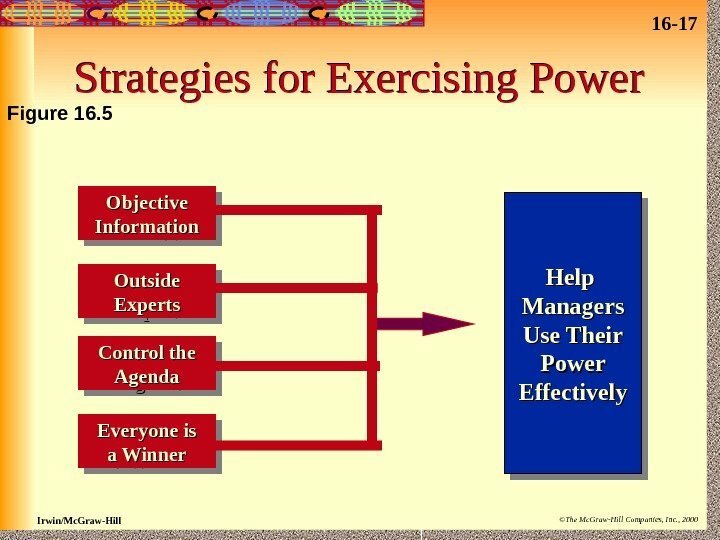 Graw-Hill Companies, Inc. , 2000 Strategies for Exercising Power Objective Information Outside Experts Control the Agenda Everyone is a Winner Help Managers Use Their Power Effectively. Figure 16. 16 — 18 Irwin/Mc. Graw-Hill ©The Mc. 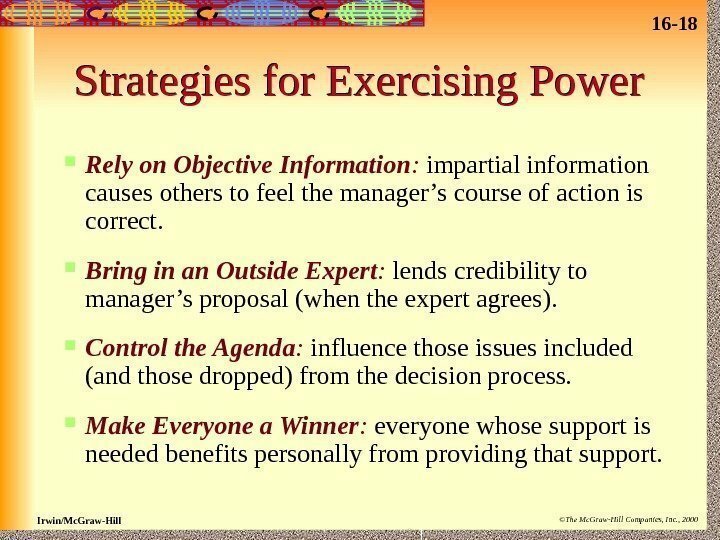 Graw-Hill Companies, Inc. , 2000 Strategies for Exercising Power Rely on Objective Information : impartial information causes others to feel the manager’s course of action is correct. Bring in an Outside Expert : lends credibility to manager’s proposal (when the expert agrees). Control the Agenda : influence those issues included (and those dropped) from the decision process. Make Everyone a Winner : everyone whose support is needed benefits personally from providing that support. 16 — 19 Irwin/Mc. Graw-Hill ©The Mc. 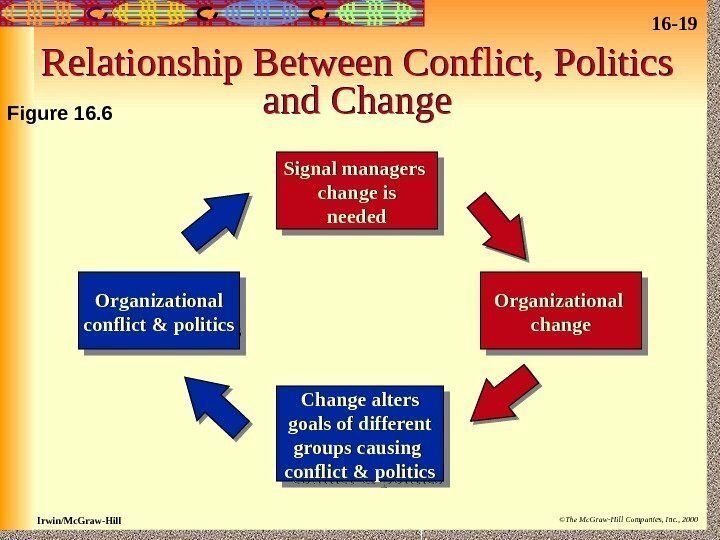 Graw-Hill Companies, Inc. , 2000 Relationship Between Conflict, Politics and Change Signal managers change is needed Organizational change Change alters goals of differentgoals of different groups causing conflict & politicsconflict & politics. 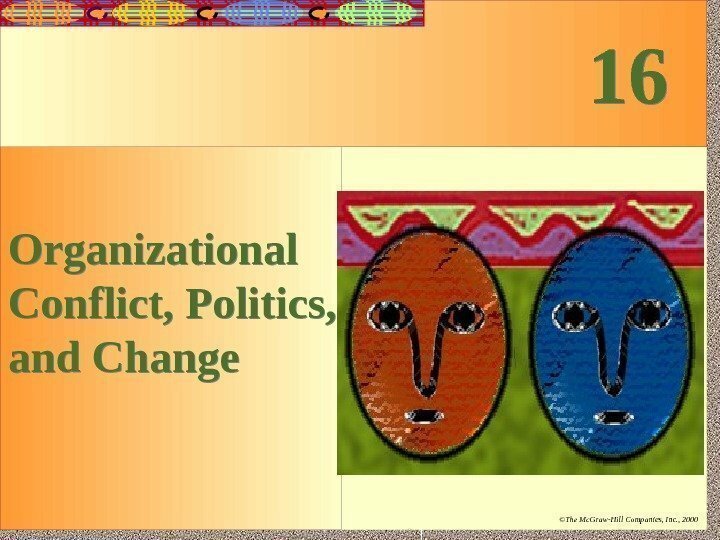 Organizational conflict & politics. Figure 16. 16 — 20 Irwin/Mc. Graw-Hill ©The Mc. 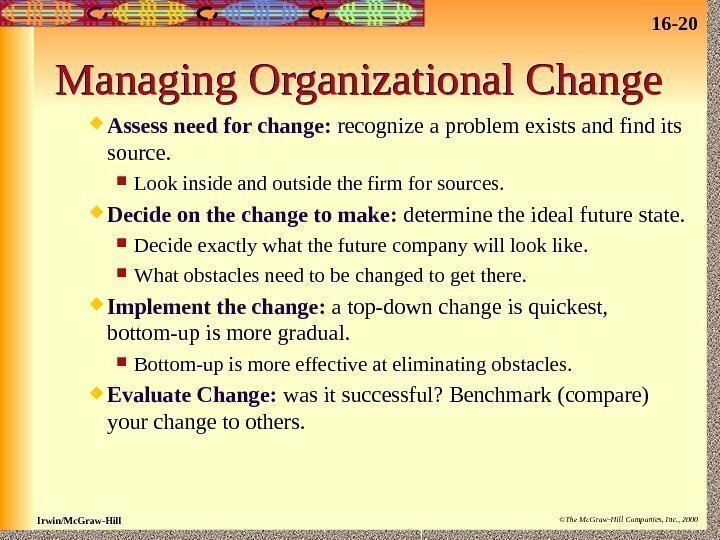 Graw-Hill Companies, Inc. , 2000 Managing Organizational Change Assess need for change: recognize a problem exists and find its source. Look inside and outside the firm for sources. Decide on the change to make: determine the ideal future state. Decide exactly what the future company will look like. What obstacles need to be changed to get there. Implement the change: a top-down change is quickest, bottom-up is more gradual. Bottom-up is more effective at eliminating obstacles. 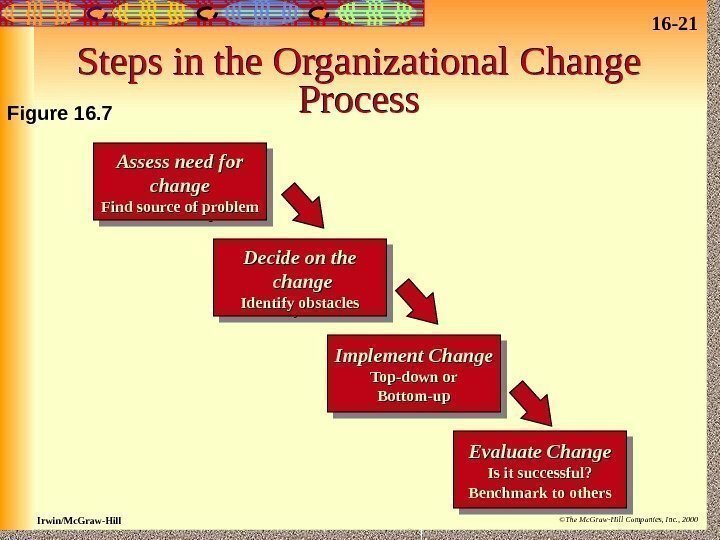 Evaluate Change: was it successful? Benchmark (compare) your change to others.